If you are not aware of the functionality of AllWebMenus, please read the related "Features" page. Download "AllWebMenus Add-in for Microsoft Expression Web 4"
AllWebMenus v5.3.864 or above. If not already installed, please download its latest version here. Version 4 (or above) of Microsoft Expression Web. For versions 1 and 2, you may optionally choose to install their Add-ins during the AllWebMenus installation. 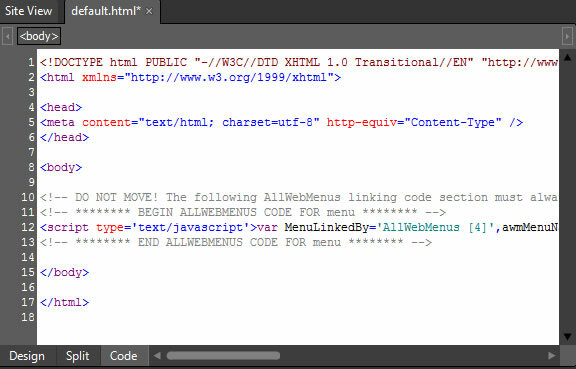 This method requires that you have installed the "AllWebMenus Add-in" in Expression Web (see above). 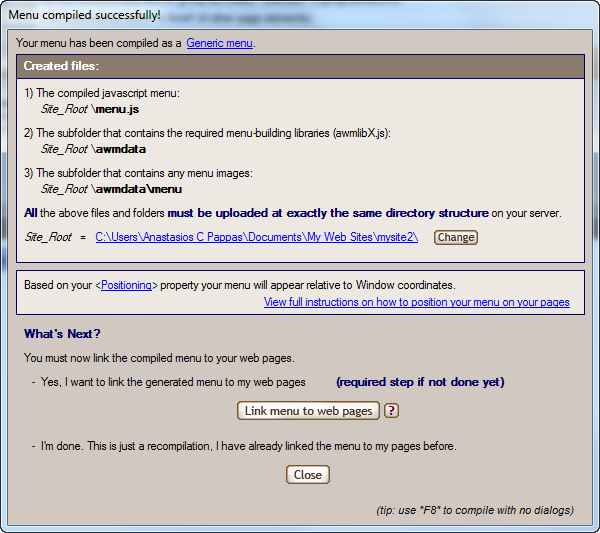 This is also where you must change the "compiled menu name" in case you want to have more than one menus in your site. 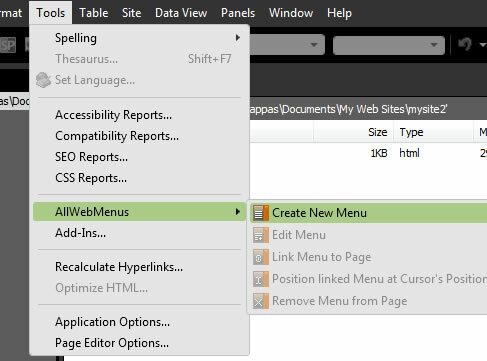 You don't have to "Link menu to web pages" since the process can be done by the AllWebMenus Add-in of the Expression Web later. Save the project in any location of your local machine (preferrably inside the folder where the rest of the web site files are stored) for future reference. Although you can get a rough idea about how the menu will look like, the most accurate preview method is to see the web page in an external web browser after you publish the web site. Edit Menu: Opens the *.awm project you saved during the menu creation. Note that if the location of the *.awm file has changed since the menu is created or if you didn't save any awm file at all, the Add-In will not find it and will asks for its new location. Link Menu to Page: This is useful when the menu is originally linked in some of the pages and you want to repeat the process for the other pages too. 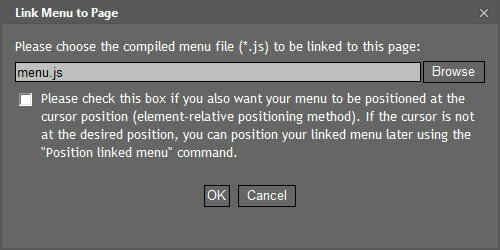 This command asks for the *.js (menu) file that comes from the "Compile" command in AllWebMenus. Position linked Menu at Cursor's Position: This is a kind of visual aid when you create web pages in "Design" view. The Add-In finds the cursor's exact location and adds a small piece of code for the menu to be re-positioned there. Remove Menu from Page: Assuming that a menu is already linked in the page, the command will delete it. 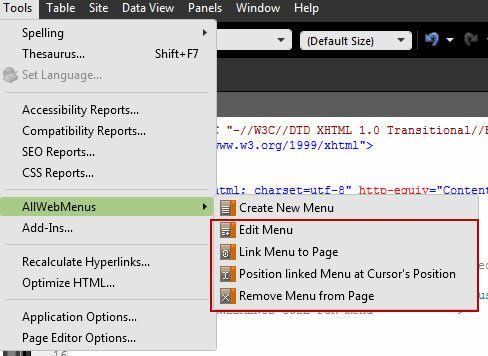 If you used the "Position linked Menu at Cursor's Position" command, the remaining piece of code (which usually has and "ID" starting with "awmAnchor...") will remain intact to prevent any possible problem with the rest of the page code (some times the menus are using common page elements for their positioning and these cannot be deleted by the Add-In). In this case the anchor code can be deleted manually if it is not used anywhere else. This method does not use the "AllWebMenus Add-in" (not required). Typically, when you create a new website the files are stored in the folder C:\Documents and Settings\UserAccountName\My Documents\My Web Sites\mysite (unless you change the folder during the website creation). 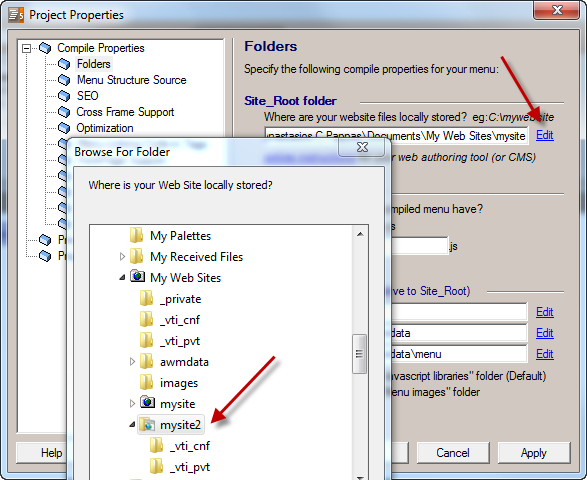 This means that the HTML files that you wish to contain your menu are located inside that folder. As you can see one of the files has the extension *.dwt and that means that this file is a Dynamic Web Template. Unlike Frontpage, Expression Web does not use shared borders (unless you use third party tools to restore this kind of functionality). Instead of this "old approach" the template system has been adopted which is a more flexible way to create and maintain a website. You attach a Dynamic Web Template to the pages in a website, and that template defines the layout for those pages. You can use any number of Dynamic Web Templates in a website, and you can attach a Dynamic Web Template to as many pages as you like. Since there are no shared borders, all you have to do is to link the menu in the dwt files of your website. After you complete the compile process, in the form that appears, select the button that allows you to link the menu to your web pages. Make sure that you have selected the "Templates (*.dwt)" file type in the combo box below the file list for the master.dwt file to be visible. Select the master.dwt and/or any other dwt file of your website and press the button shown in the bright green circle to add the file(s) in the list of files where the menu code will be inserted. That's all! The menu is linked in the template and each time you need to change the menu you have to repeat the 2nd step just for the menu files to be updated. The menu will appear in all html pages attached to the dwt template files where the menu is linked. It is highly recommended to use Dynamic Web Templates to handle a multi-page website in order to keep your files updated in the most easy way. 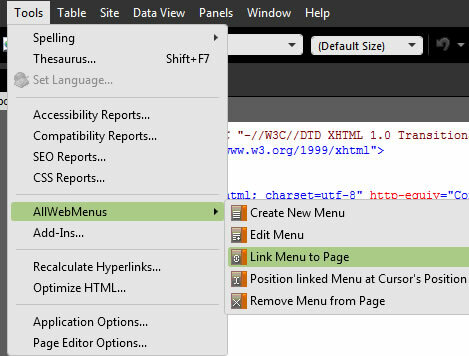 If you don't want to use DWT files (integration method 2 above) or the pages of your website are not so many, you can always link the menu directly in your html files just like in any other web authoring tool. This case is covered in the generic AllWebMenus linking process.